The above info came from atomofish, and was edited by yours truly (contact me). The image came from darklazarus.skyblog.com. 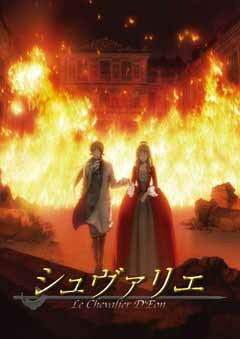 Le Chevalier D'Eon presents a unique anime take on the history of Louis XV. During his reign, many women have mysteriously vanished. D'Eon de Beaumont's sister Lia is one of the many victims, until she is found dead in a coffin down the Seine river. Determined to find out how she died, D'Eon believes the Duke Orleans is involved, but he uses his power as a member of the secret police to help investigate. However, things take a strange twist when the Duke and the police are mysteriously murdered leaving D'Eon a survivor due to a mysterious cross around his neck. And things proceed to get stranger when D'Eon suddenly becomes possessed by Lia's spirit.